Gaétan has a water garden he wants to fill with sunfish. To start, he has 4 sunfish and adds more each week. How many more sunfish does Gaétan add each week? 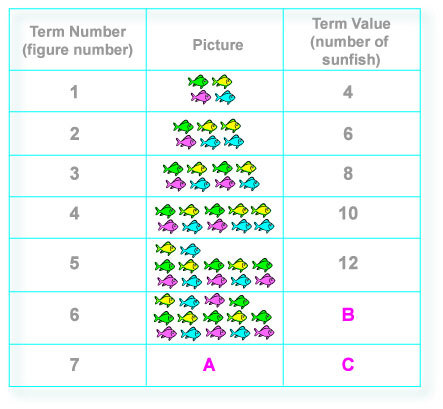 How many fish does A represent? What value does B represent? What value does C represent? Select the rule that tells how the value of each term in this pattern can be calculated from the previous term in the sequence. Start with 4 and add 3 each time. Start with 4 and double it each time. Start with 4 and add 2 each time. Start with 4 and add the next greatest even number. Select the rule that tells how the value of each term in this pattern can be calculated from its term number. Predict the value of the 9th term and then select the correct answer below. Predict the value of the 19th term and then select the correct answer below.